Through the generous sponsorship provided by the Western Section of the AUA, Dr. Jonathon Wu traveled to Hue, Vietnam with mentor Dr. Walter Beh. Dr. Wu and his mentor collaborated with Dr. Hung and his colleagues of the urology department, focusing on 19 patients with difficult cases. 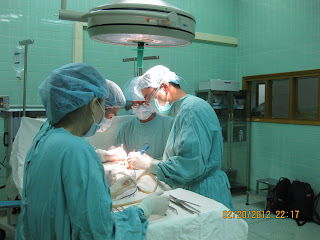 Dr. Wu was able to perform his first open pyelolithotomy under the supervision of a Vietnamese colleague, Dr. Tuan. “In our two weeks of working mainly with Dr. Hung, I was very impressed by his surgical technique. Open surgery involved tediously dissecting out important structures and controlling all bleeding quickly with cautery or ligatures. He moved very quickly in the OR but was very purposeful with his movements. No suture was wasted as instrument tying was performed whenever possible. Bigger cases would often involve 2 attending surgeons intertwined in a well-rehearsed ballet.“What was even more impressive was the efficiency and resourcefulness of the hospital. 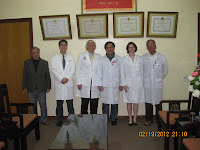 We mostly worked with Dr. Hung who has been on the urology staff for 6 years. He is quite motivated and very enthusiastic.